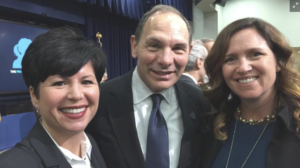 Sunnie Southern, left, CEO of Cincinnati-based Viable Synergy, participated in a White House summit on precision medicine with Indian Hill resident Bob McDonald, former CEO of Procter & Gamble Co. and now U.S. secretary of Veterans Affairs, and Sarah Giolando, chief strategy officer of Edgewood-based St. Elizabeth Healthcare. St. Elizabeth will establish a resource center called the Precision Medicine Innovation Station. Patients and their families will be able to identify doctors who offer precision medicine testing and receive direct access to their test results there. They also will be able to sign up for support services such as genetic counselors and medication financial assistance programs and join peer support communities. Partnering with St. E to establish the Precision Medicine Innovation Station is Sunnie Southern, CEO of Viable Synergy in Cincinnati’s East Walnut Hills neighborhood, which focuses on innovation and technology related to health care. Southern and Giolando were among health care experts from throughout the nation who met with President Barack Obama at the White House on Feb. 25 as part of a summit on how genetic testing can personalize the treatment of cancer, heart disease, depression and other illnesses.